Binding is my least favorite part of the quilt making process. Especially if it is a big, queen-sized mother like this wool [ ] quilt. FIRST there is the continuous, continuous, continuous bias strip, which can sometimes be fun to make, but not so much, when you have to be relatively precise about it, and you have to make and iron miles of it. THEN it's time to haul the binding and the quilt under the machine in a smooth fashion, and again it seems like a never ending journey. AND then it's time to hand stitch the binding into place. It takes forever to turn a corner, let alone four of them. It's practically a marathon! YET when finished, I find there is hardly anything more satisfying than a beautifully bound quilt, in the way it simultaneously brings together the quilt as a whole, and signifies the completion of a creative cycle. 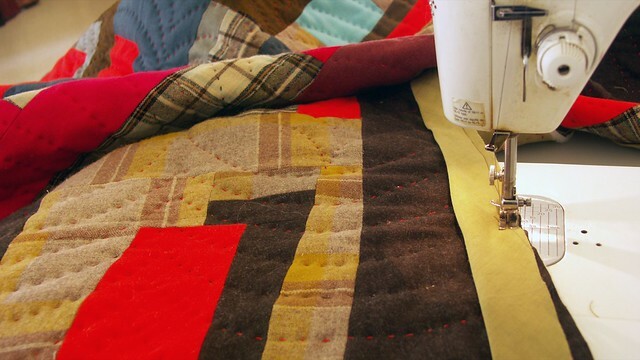 What part of the quilt making process is your least favorite or most satisfying, and why?